In addition to five canopy beds in double rooms, our Superior category also includes a few marble bathrooms. These are rooms where one can easily envision Greta Garbo or Zarah Leander, stars of the silver screen who have stayed at our grand hotel situated close to Berlin’s Kurfürstendamm, Savignyplatz and Zoo. Each of the spacious rooms with up to 30 sq m (325 sq ft) has its own floor plan and unique charm. One can search in vain for the anonymous standardized size and look of large hotel chains – ever since opening in 1929, Hotel Savoy has offered its own specific charisma. 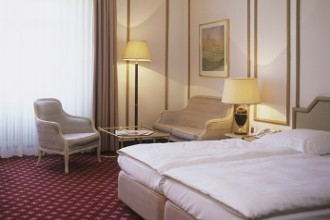 Generally, the single rooms contain standard single beds while double rooms are equipped with double beds. Rooms with a view towards our bright and spacious garden courtyard are especially popular. The rooms facing Fasanenstraße – a calm side street that crosses Ku’damm and Kantstraße – look onto the historical facades of Delphi Filmpalast and Theater des Westens.